Find the light inside a difficulty <br />and the gift wrapped in a problem. and the gift wrapped in a problem. PURIFICATION is a major transformation of old ways of being into new, healthier ones. Purification is a process of cleaning the crud that clogs, pollutes, or otherwise dirties things. The pure thing has been restored to its original state of clarity, openness and freshness. Think of clarified butter, or the treatment of waste water back into clear, drinkable water. 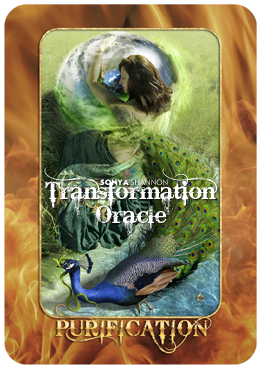 The PURIFICATION card is a call to spiritual growth. Purification is about not letting yourself off the hook. It’s about holding yourself accountable to clean up negative attitudes and opinions. The lesson here involves becoming more mature. To be truly adult, we need to move beyond resentments, self-pity, and blame of others. We need to purify our inner attitudes so we no longer tarnish the present moment with condemnation, contempt or disgust. When the PURIFICATION card shows up, we are on track to get beyond allowing ourselves to be “triggered.” We become ready to stop our habitual reactions and judgments when we don’t approve of something. When the going gets tough, instead of saying, “Why me? !” or, “Oh NO! Not AGAIN!” or, “What am I doing wrong??! !“, we try asking new questions. “What is the lesson here?” is a good question to ask. “How can I use this relationship / situation for my highest good?” “How can I be of service to someone today?” Replacing old, unanswerable questions takes us out of the victim / martyr role and puts us in a better position to help ourselves grow. The artwork has several key symbols. The peacock transforms venom from the poisonous snake into glorious plumage. Wetland grasses filter the impurities from water. The goddess opens her compassionate heart to Planet Earth to heal the toxic atmosphere. All are alchemical metaphors for the ways we can purify ourselves psychologically. It’s time to stop complaining, ranting, and cussing (outwardly OR inwardly!) and transition into gratitude and peacefulness. If the PURIFICATION card appears upside-down in your spread, the resentment or emotional entrapment you experience may be more powerful than your willingness to dissolve it and move on. Check the elements of the other cards in your spread to see areas where you need to focus to grow spiritually now.